“I ❤️ kombucha” - would be my bumpersticker if I owned a car. Or maybe “Follow me to the SCOBY hotel”. Either way I am now officially a home kombucha brewer/fermenter. I received my first SCOBY from a friend last summer and I have been brewing ever since. For my first few recipes I used the cheapest black tea I could find at the store - hey, I didn’t know if I was going to like it so why invest too much money, right 🤷🏻? I also fermented in my husband’s beer vessel - he didn’t really like that and later used it as an excuse to buy a fantastic new stainless steel fermentation tank for brewing his beer. The black tea version was ‘okay’, I had brewed a couple of batches and was feeling more comfortable to try a different recipe. I wanted to try green tea and found a recipe from Betsy Nelson. But I couldn’t just follow a recipe, again my husband’s exacerbated sigh indicated that he wished I would just stick to a recipe, just once! I needed to add my own twist, mint. Just as I add the mint, that same husband pipes in with “you are making Moroccan Mint Tea”, he is full of interesting, and sometimes useful facts. So here you go, my recipe for Moroccan Mint Tea Kombucha! Measure the tea, mint, and sugar into a vessel for steeping, this can be a pot, tea kettle, or I sometimes use a French press. Add boiling water to the tea and let steep until cool, stirring to incorporate the sugar. While the tea concentrate is steeping I prepare my brewing/fermentation vessel. Currently I’m using the FÖRFRISKNING beverage dispenser from IKEA for $19.99. DON’T try to steep the hot tea directly in this container, it will break - I know. Steep the tea in a metal pot or something else heat resistant. I typically have a ‘just completed’ batch of kombucha so I need to remove the SCOBY from the vessel, I give it a quick rinse to remove the gunk and put it on a dinner plate while I finish the rest of the preparations. Next I save the remaining batch of kombucha, I will use this as the starter for this batch. I give the vessel a good rinse with just water and using my hand I wipe all down the sides. I avoid using a dishcloth or soap so I don’t introduce any new bacteria or bacteria killing agents. The leaves of this green tea are rolled into the shape of little pinhead pellets resembling gunpowder, hence its name. Tastes bold & lightly smoky. Higher in caffeine than most green teas (35-40 mg/8 oz serving). Green tea is rich in powerful antioxidants, and has been known to fight viruses and slow aging. Green tea aids in weight loss, reduces "bad" cholesterol, boosts the immune system, and is also associated with the prevention of cancer. Green tea is widely used as a natural preservative in food and cosmetics. It even looks fresh and healthy! Green helps overweight people shed excess fat without side effects. It may help modulate calorie and fat burning through the sympathetic nervous system, the adrenal glands and specific nerve chemicals. Green tea shows fat-burning properties beyond those explained by its caffeine content. Once the glass vessel is clean (remember to clean the dispenser too!) I begin to add the remaining water. I use filtered water from my Brita so this takes a few minutes to filter enough water. I add 3 litres of filtered water directly into the vessel. Then I measure what is left of the previous batch of kombucha. I only ever use max 1 litre of starter. I’ve used as little as 400ml. The amount you use doesn’t really matter but the speed of your ferment will change depending on the volume of starter and the ambient temperature of where you are brewing. If there is less than 1 litre of starter I take what ever is left and add filtered water to reach 1 litre of liquid. Example: I have only 350ml of starter, then I would add 650ml of water to equal 1 litre. I add the starter/water mixture to the 3 litres already in the vessel. By now the tea should have cooled a bit. It’s your choice at this point if you want the tea to steep until completely cool or not. I would not steep less than 20 minutes but some recipes I’ve seen tell you to steep for several hours. Basically you’ll never get a straight answer on how to do this, it’s all in how you feel that day. Busy? Steep 20 minutes and get going. Feeling lazy or get side-tracked, great, the tea steeps longer. 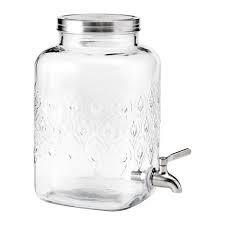 For all home fermenting/brewing, etc. I strongly recommend taking notes. The next batch then you can adjust the mixture of tea or use more/less starter, steep longer, etc. but unless you write it down you’ll never remember what you did. Here you can see what it looks like to separate the mother from the child SCOBY. The child grows on top. You don’t need to separate them but I like to. Remaining amount of kombucha from the last batch. Mine typically sinks, it’s not an issue. Ok, back to the recipe. Once you have decided that the tea concentrate is ready, strain the leaves and add it to the vessel (with the 3 litres water and the 1 litre starter/water mix). Before you put the SCOBY into the vessel, make sure the liquid is no more than slightly warm. If it’s too hot you risk damaging the SCOBY. I typically never have an issue with this because the 4 litres of liquid cool down the 1 litre of tea concentrate pretty quickly. I take my beautiful SCOBY and gently add it back to the new batch. Mine ALWAYS sinks, it doesn’t matter, it will still ferment the tea. To finish off the new batch I use a piece of masking tape and add the date to the vessel - even though I write down my recipe each time - it’s just easier to have the date on the vessel so I can see it just at a glance. I also take a piece of cheese cloth or muslin and put it over the opening secured with a rubber band. The whole thing goes into the pantry and the SCOBY goes to town on the sugar in the tea. I keep a little shot glass next to the vessel so I can periodically try the brew to see if it’s done to my liking. I don’t do a second ferment, partly out of laziness, partly out of fear of exploding my glass jars. The second ferment makes it bubbly which is nice but not a necessity for me. After a number of days/weeks I bottle the whole batch, label and store in the fridge. Sometimes I drink it straight from the tap of the brewing vessel. This setup is perfect for a continuous brew too. That is an article for another day. This post is by no means a full article on how to brew kombucha. There are tons of videos on YouTube that go into more detailed explanation on how kombucha is made. Check out my playlist below to see the videos I watched when just starting out. My favorite videos for anyone that wants to start brewing their own kombucha. Are you a home kombucha brewer? What is your best/worst experience of home fermentation?